The Linstead Hospital is set to benefit greatly from the second staging of the Tru Juice Sound Di Alarm Music Festival slated for New Year’s Eve at the Dintill Sports Complex in Linstead. The event, organized by Reggae vocalist Iba Mahr, his Iba Mahr Foundation and the Harrar Music Group, saw great success at last year’s staging and will see this year’s net proceeds going towards the Linstead Hospital where Iba himself was born. These details were disclosed at the official launch of the event held at the hospital grounds on Wednesday, December 14. With media entities present and major sponsors, patients and artistes performing, the launch sought to highlight the needs of the hospital. 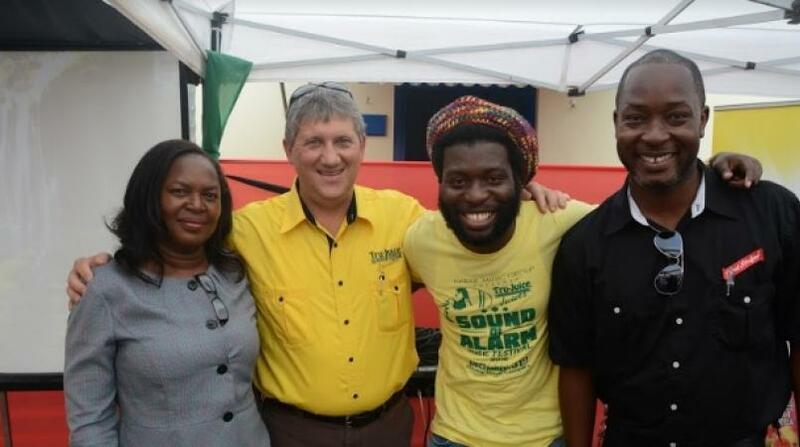 The Sound Di Alarm event marks the first phase of Iba Mahr’s commitment to assist the establishment. “The Linstead Hospital stands in the middle of several communities and has to facilitate a constant stream of persons seeking medical care. It has not changed much in infrastructure and has not had any major upgrades since 1953, I have made it my duty to utilize my position as a member of the music fraternity to host an event that will generate the funds needed to assist and to begin the much needed refurbishing of the facility.” Iba Mar shared at the launch. The hospital has needs in the areas of infrastructure, equipment servicing, ambulance repair and replacement, and general cleaning and maintenance. Already the music fraternity has come out to support the initiative by greatly reducing their performance costs so patrons can attend the event for just a $1,000 entry fee. Artistes like Sizzla, Capleton, Anthony B, Chronixx, Queen Africa, Bugle and more will grace the stage of Tru Juice Sound Di Alarm Music Festival on December 31. “I feel every Jamaican should have access to the thing that has brought Jamaica recognition on the world stage - 'reggae music'. That is the main reason for the decision to price the tickets for what they are. The money from the tickets will only be used to cover expenses, pay artistes, and refurbish the Linstead hospital," Iba Mahr added. At the launch on Wednesday Morning, title sponsor Tru Juice and major sponsor Red Stripe commended the artiste for taking on such a worthy cause and pledged their continued support to the Sound Di Alarm event. Performers Mackeeham, Chevaughn, Feluke and Duane Stephenson gave soulful renditions that the entire hospital community enjoyed; the Linstead community was further treated to a pre-show on Wednesday night at the Rose Duncan Park in the town where Tarrus Riley, Iba Mahr, Luton Fyah, Junior Cat, Loyal Flames and many more acts performed. The newly formed Iba Mahr Foundation has also donated fans to the Linstead Police Station and has been supporting projects at the Cheesefield Basic School in Linstead, St Catherine as well. Outside of his charitable initiatives, Iba Mahr, who returned recently from his North American tour, has again teamed up with gifted musicians Notis for his newest single ‘Big Machine’. Notis productions previously worked with Iba Mahr on his internationally trending ‘Diamond Sox’ single. The ‘Big Machine’ track is now available on digital platforms including iTunes.